Due to the popularity of the Classic Inca Trail, often it is impossible to book a trek during the peak season (May to August). Therefore, various tour companies have begun to offer alternatives to the Classic Inca Trail that hike to the Machu Picchu area via routes that pass near Salkantay Mountain. These Salkantay Inca Trails use various routes to Machu Picchu, and some even connect to the Classic Inca Trail. However most commonly, the Salkantay Alternate Trek is independent of the Classic Inca Trail and ends below Machu Picchu in the town of Aguas Calientes rather than at Machu Picchu proper. One other difference is that the Salkantay Inca Trail does not encounter numerous Incan ruins as does the Classic Inca Trail. Nonetheless, this Alternate Trek represents a realistic alternative for those who find the Classic Inca Trail unavailable or want to try an alternative trek. The Salkantay Inca Trail gets its name from Salkantay Mountain, which at 20,574 feet (6,271 meters) is higher than any peak in North America. 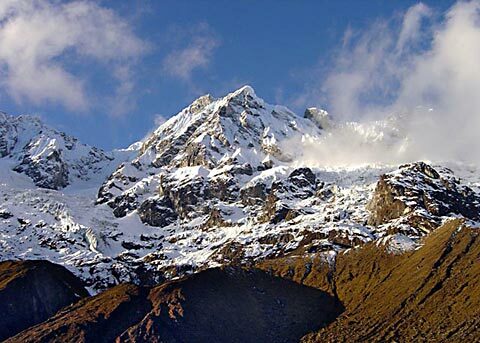 Salkantay means "Savage Mountain" in Quechua and some say the name comes from the observation that often rapidly swirling clouds rise up from the rain forest below and surround the peak. Typically, the Salkantay Alternate Trek to Machu Picchu takes five to seven days and is more difficult than the Classic Inca Trail in that it is longer and reaches higher elevations. The Salkantay Alternate Trek begins near the village of Mollepata at 9,515 feet (2900 meters). Usually, outfitters use pack horses to help carry food and equipment in order to lessen the burden on trekkers. During the first day, hikers enjoy magnificent vistas of "Apu Salkantay" and the lush Apurimac River Valley below. The trail passes through Andean communities like Cruzpata, Challacancha, and Soraypampa where the first campsite is usually located. After the first day, trekkers will encounter very few locals on their journey to Machu Picchu. The second day begins with a three hour ascent to the Apacheta Pass at 15,060 feet (4,590 meters). From the pass, hikers can see three mountains, Salkantay, Humantay, and Huayanay. After a five hour downhill hike, trekkers arrive at Rayan-Niyoc or Chaullay to camp for the night. On the third day, hikers travel to Uscamayuc, where they are first be introduced to the cloud forest niche called the Ceja de Selva ("Crest of the Jungle"). In this high jungle, the species richness is greater than at elevations either above or below, with numerous species from both the mountains above and the jungle below occurring here. In fact, the number of orchid species living in this area is thought to be among the highest in the world. 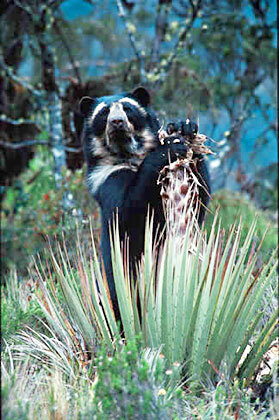 In addition, rare animals such as the Oso de Anteojos or Spectacled Bear (Tremarctos ornatus) are found in this habitat and frequently seen by hikers. The third day ends at the village of La Playa (7,710 feet or 2,350 meters) where the final camp is made. The fourth day begins with a hike to the village of Lucmabamba and then to the Incan ruins of Llactapata at an altitude of 9000 feet (2,740 meters). At Llactapata, trekkers get their first glimpse of the sacred Incan city of Machu Picchu. Recent studies of the Llactapata Ruins indicate that this settlement was positioned, designed and functioned as a sacred center similar to Machu Picchu, with a distinctive combination of geographical features and revered mountains creating analogous astronomical alignments. Further proof of its significance is the presence of a sun temple that is similar in size and dimension to that at Coricancha in Cusco. Llactapata was first discovered and studied by Hiram Bingham in 1912 and referred to by him as "the ruins of an Inca castle." However, its discovery was overshadowed by Machu Picchu and recently archaeological studies have revealed its true significance. After Llactapata, the final leg of the journey ends by either hiking (or taking the train, if available) to the town of Aguas Calientes, where trekkers spend the night and then explore Machu Picchu on the fifth and final day of the trek.